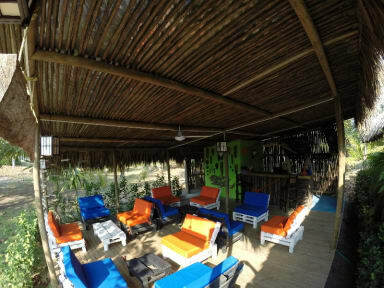 Hotel Playa Mandala v Palomino, Colombia: Zarezervujte nyní! 1 of them is not located on the beach directly, but surrounded in the green area just next to the beach. The cabañas are distributed like this, to give each client its privacy. Each cabaña sleeps up to 4 people, have a private bathroom, terrace with hammock, fan and minibar. 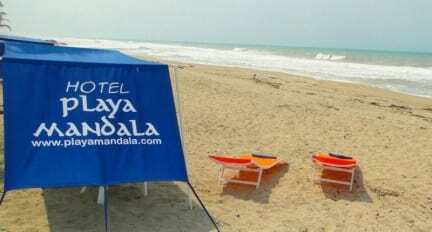 On the beach, we provide chairs and parasols to relax. There is free Wifi in the bar and lobby of the hotel. From the hotel, you have the spectacular views of the Sierra Nevados Simon Bolivar and Cristobal Colon.